Ike Jackson has been involved with STRYKE since 2015 and has been an influential role in STRYKE's growth and culture, we are excited to have him return this 2018 season as Show Designer for STRYKE Percussion and STRYKE Percussion 2. Ike Jackson has been working with Ayala High School since 1991. In his twenty-four years as a percussion instructor, he has worked with more than 50 different percussion programs at the high school, college, and drum corps levels. A prolific percussion arranger, judge and drill designer, Ike has worked with various percussion ensembles all across the US. His competitive marching career started as a teenager as a member of the Sound Machine Youth Organization. He then performed as tenor player for the Riverside Community College Marching Tigers from 1992 to 1994. Finally, he finished his marching career as a member of the 1994 Blue Devils Drum and Bugle Corps, going on to win the title of World Champion. 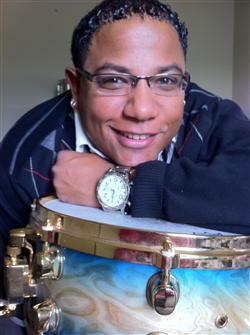 Ike is currently Vice President of the Southern California Percussion Alliance and a founding member of SCPA. He is also a member of the Winter Guard International Percussion Advisory Board and has worked on the Steering Committee as well. Ike has helped his percussion ensembles win 12 WGI World Championship medals, 23 WGI World Championship Finalist placements, 47 Regional Finalist placements, 14 Regional Championship titles, and a Bands of America Grand National Finalist appearance in 2004 and 2014. He was the Corps Director of the 2006 Division III World Champion Impulse Drum and Bugle Corps and was the Percussion Caption Head at The Academy Drum and Bugle Corps from 2013 - 2016. Program Coordinator for Sacramento Mandarins in 2017. Locally, his ensembles have won 10 SCPA Championship medals and over 60 first place awards. Cisco Hance has been involved with STRYKE since 2008. This season he will be leading the ensemble as Ensemble Director, overseeing the ensembles Design and Education team as well as continuing to arrange the battery music. Cisco is very excited in what STRYKE 2018 has in store. Osman “Cisco” Hance currently resides in Port St. Lucie, FL. He has been involved with DCI since 2003. He started marching with Magic of Orlando under the instruction of Colin McNutt and Brian Tinkel. In 2005 he joined Carolina Crown and acted as center snare and percussion section leader from 2005-2007. While at Crown he was under the instruction of Brian Tinkel, Jeff Queen, Ian Hale, Lee Beddis, Zach Shlicker, and Luis Rivera. In 2009, Cisco worked as the snare tech for the Teal Sound Drum and Bugle Corps, where he helped the corps successfully transition into DCI’s World Class. Subsequently, Cisco became the snare technician for the Madison Scouts Drum and Bugle Corps. Today, Cisco serves as the Percussion Director/Arranger for the Park Vista Marching Band in Lake Worth, Florida as well as Percussion Arranger at Jupiter High School in Jupiter, FL. He served as the Percussion Coordinator in 2014, Percussion Manger in 2016 for The Academy Drum and Bugle Corps, and became the Percussion Caption Head in 2017. Eddy Falcon has been involved with STRYKE since 2010 and will be returning to STRYKE for the 2018 Season. Eddy plays a pivotal role for SPW as part of our Design Team and the Visual Supervisor overseeing the visual program this season. Falcon, a native of New York City began his drum corps career at the age of 11 with a local Division 2/3 corps named The Cadets of New York City. He marched four seasons with the corps before joining the DCA circuit, where he played trumpet and mellophone with The Bushwhackers (Hackensack, NJ) and later, The Syracuse Brigadiers (Syracuse, NY.) After getting a taste of the activity, Falcon went on to march with The Cadets Drum and Bugle Corps (Allentown, PA) for the 2006 and 2007 seasons. The following year, Eddy spent time as a freelance trumpeter in NYC, gigging and playing in a few off Broadway shows throughout the city. During that time, he was casted to join the Tony and Emmy award winning show, “Blast!”. Falcon has done multiple tours with “Blast!” including a U.S. national tour and a tour of Asia. His roles included trumpet, piccolo trumpet, mellophone, flugelhorn, conducting, didgeridoo, snare drum and auxiliary percussion instruments. When not on tour with “Blast!”, Eddy was a part of another theatrical production, ”DRUMLine LIVE”. At DRUMLine he played both brass and percussion instruments, His role also involved different styles of dancing and singing. Falcon has been involved with both “Blast!” and “DRUMline LIVE” since 2008 and has had the opportunity to tour the United States, Japan and Korea multiple times with the companies. Falcon’s previous drum corps teaching experience includes: The Boston Crusaders visual staff (2010-2013, 2016), The Madison Scouts brass staff (2014), and The Cadets visual staff (2009 and 2015). Falcon is an active drill writer, consultant and instructor for various groups across the country. Matthew Hernandez is the newest addition to the STRYKE Percussion Design Team, and will incharge of Front Ensemble Arranging and Sound Design of our 2018 Production. We are very excited to have him come onboard this year. Matthew is a composer, arranger, and instructor based in Southern California. He currently serves as the Front Ensemble Caption Head (since 2013) and Arranger (since 2017) for the Blue Stars Drum and Bugle Corps. He has worked with various groups across the country and given clinics across the US and overseas in Taiwan. In addition, Matthew is currently a percussion instructor at Vista Murrieta High School (2015-present), Woodbridge High School (2015-present), Los Alamitos High School (2016-present), and RCC Indoor Percussion (2015-present). Matthew has also been an active employee of Wunderpit Music (www.wunderpitmusic.com) since 2011.